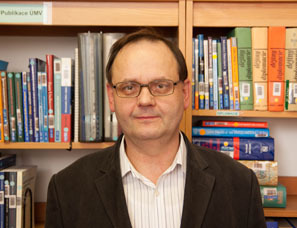 Vladimír Handl works as a Research Fellow with the Department of German and Austrian Studies, Faculty of Social Sciences, Charles University. He completed his post-gradual studiy at the State Institute of International Relations (MGIMO) in Moscow. His areas of interest include German foreign policy, Czech foreign policy, Czech-German relations and transformation of communist parties in central Europe. Apart from his position at Charles University, he is also an associate Researcher with the Institute of International Relations, Prague. He was visiting professor and researcher at many institutions abroad, i.e. University of Birmingham, Heinrich Heine Universität Düsseldorf and Foreign Policy Research Institute, Philadelphia. Handl, Vladimír (2014): Spolková republika Německo v české zahraniční politice. In: Kořan, Michal (eds. ): Česká zahraniční politika v roce 2013: Analýza ÚMV. Praha: Ústav mezinárodních vztahů, 97-115. (2013): Spolková republika Německo v české zahraniční politice. In: Kořan, Michal (ed.) Česká zahraniční politika v roce 2012: Analýza ÚMV, Praha: Ústav mezinárodních vztahů, ISBN 978-80-87558-12-6, 85-106. 2014-2016 Czech Foreign Policy and the “Post-Western” Global Order. The Czech Grant Agency GAČR. Co-Researcher. 2013-2015 Szenarios of the international Environment. Grant Agency TAČR 7664/2013. Co-Researcher. 2014 Project on populist parties in Europe, Faculty of Social Sciences, Prague. Co-Researcher. 2014 10 years of Czech memberhip in the EU. Project funded by the EU Delegation in Prague. Co-Researcher. 2012-2013 New role of Germany in the EU, the future of the Berlin-Paris axis, and the perspective of a multispeed Europe from the point of view of the interests opf the Czech government. Projekt TAČR. Co-Researcher and Coordinator. 2010-2013 Security multilateralism as an institution. Theorizing and implications for Central and Eastern Europe. The Czech Grant Agency GAČR. Co-Researcher. 2010 Differentiated proces of German foreign policy making: institutions, actors, norms and interests, strategies. Ministry of Foreign Affairs of the Czech Republic. Main Researcher. 2008-2010 National research project II. Rady pro výzkum a vývoj (RVV) European Intengration and the Interests of the Czech Republic. Co-Researcher.